opening the year with an adventure tandem with the country's most innovated adventure tour group Travel Factor and the efficient and reliable Victory Liner. 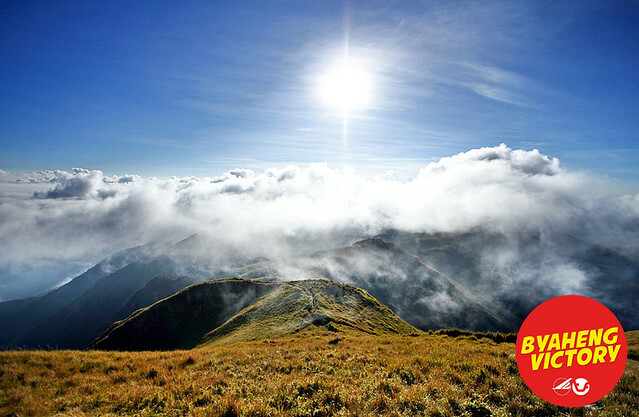 this time to trek Luzon's highest peak Mt. 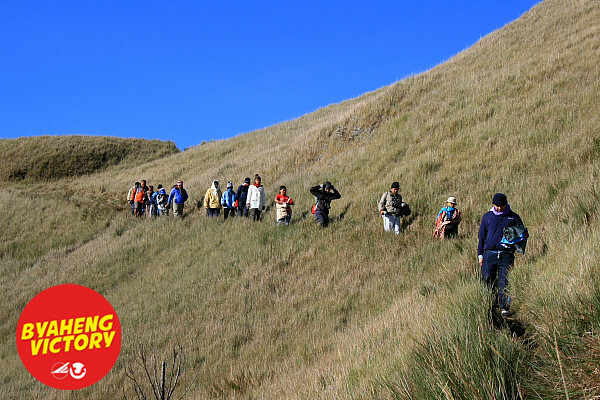 Pulag on the coldest month. it's just three days before we leave and this has been one of my most anticipated trek this quarter. returning to old trails doesn't matter much as the experience will always be something different. like last year, i started the year trekking Mt.Timbac Luzon's third highest point. so for 2013, this will be my travel kick-off for 2013.
just last month, i noticed that Travel Factor has released an IOS app and i immediately downloaded it. 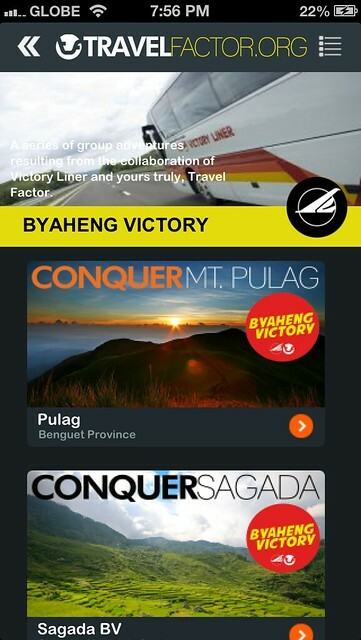 the app will serve travelers to access tour packages and important information which includes Byaheng Victory trips. one can download it for free over Apple App Store. two thumbs up to Travel Factor! 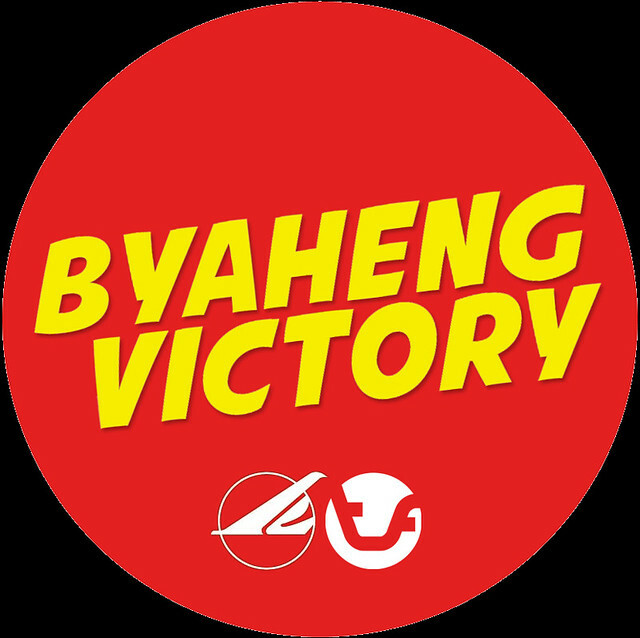 Byaheng Victory is a series of group adventures showcasing some of the most awe-inspiring North Luzon destination reached by Victory Liner, the Philippines' premiere bus transportation company. Through a partnership with Travel Factor, the country's leading adventure travel company, Byaheng Victory brings to life trips that combine the excitement of exploring North Luzon treasures and the highest level of comfort and safety that comes with every Victory Liner bus ride. For the oncoming travel season (November - May), they will be doing tours to Mt. Pulag, Mt. Pinatubo, Sagada, Kalinga, Pangasinan and Zambales. They will also be doing special trips like food tours and Visita Iglesia in Pampanga. this trip is sponsored by Travel Factor in collaboration with Victory Liner for Byaheng Victory. for more information you check out Byaheng Victory website and follow them on Facebook and Twitter. >Hi Cris, hahaha... most likely but let's see. yes. need to prepare for that temperature. thanks for adding the excitement of posting the trek soon. ibang-iba na talaga ang travel factor. level-up na! hope to try their services one of these days. Happy New Year, dong ho, and a lot of travels and trips! Happy New Year dom! Mush as i would like to be there and trek with you, di ko ata kaya ang mga ganyang bagay, haha. Being contained in the four corners of my office also leaves me some space to go around in the world, the books carry me! To new adventures for Eskapo! Cheers! so Pulag pala napili mo Dong...good luck and enjoy the subzero temp..
good luck dom. i'l check out ur daily updates here or perhaps any update about ur climb. il get inspiration from there. keep safe and ur group. >Soloflighted, they did well on bringing travelers to a great travel exeperience. it's also good that they started to share this experience to bloggers. >Traveling hawk, thanks! you too. >hi Sheng, i agree on that. reading books particularly stories of people going places. for sure you will be able to do this some time in the future. cheers to blogging! >Manong Unyol, yun ang astig! aabangan ko yan pag nagawa mo.happpy new year ulit! >MyNomadicHabits, yes. masaya kasi simulan ang unang byahe ng taon na trekking. salamat! kailangan paghandaan ang lamig. >Nik, thanks! update will be out after the trek. hoping that it will help you plan your trek in February. starting the year right, way to go. >Oman, indeed. happy new year bai! >LakwatserongTatay, hahaha... let's see. if it wont rain, ill try that. >Micamyx, oo nga. wala tayong trip na magkasama last year. One factor that I dont have that enthusiasm to climb a peak is because of fear of height. besides, my schedule being a family man. Ampo lang jud nga maka laag jud dom. hehehe. I'm so inspired by all your travels! I like all the pictures, as usual. 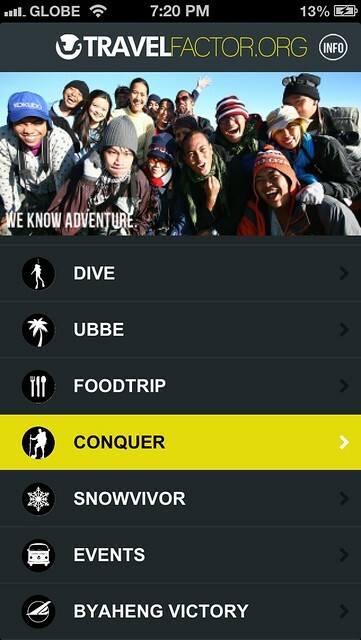 Wala bang Androip version yun Travel Factor app? I checked their website. 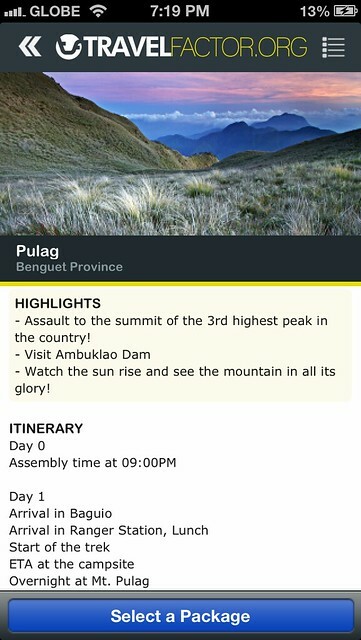 Maybe, I'll just visit na lang their site often to check out itineraries. Thanks for posting this, Dong. Ayos. I will download this. Thanks for sharing, Idol. This is a great way to start 2013 Sir. Hope I can able to climb Mt.Pulag in the future. Did you take the Akiki "Killer" trail? View on that trail is awesome! If given a chance/and if my sched. permits, I will climb this "playground of the gods" again. Anyway, thanks for sharing info re: Travel Factor app. I downloaded it just now after reading this post. I hope I can book on one of their amazing adventures. wow! what an awesome way to start the year right! 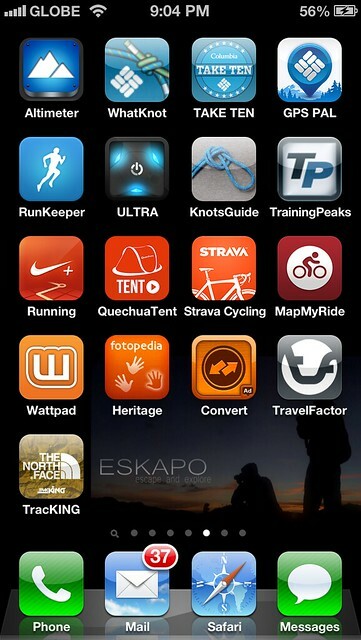 The apps looks great, I'll definitely download it and hope to climb Mt Pulag with TF too! someday, aakyat ulit ako ng bundok... someday. Can any one let me know what is the height of this luzons peak form the mean sea level ??? wow! that looks like a scenic mountain! would like to climb that too!